Unlike your teeth, your eyes usually do not hurt when there is something wrong. An eye examination can pick up early signs of damaging eye conditions such as glaucoma. 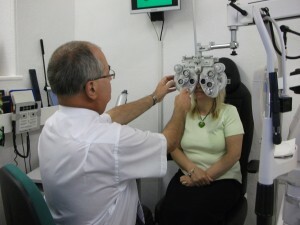 An eye examination can detect a number of common underlying health problems such as cardiovascular disease and diabetes. An eye examination determines whether your eyesight would benefit from correction with spectacles and determines the best form of correction for your vision and lifestyle. Good vision allows for better and safer work and play. In fact it often means an improved quality of life! For young people, good eyesight is vital for learning. All children should have an eye examination before they start school. Failing eyesight is often taken for granted as people get older. This is not always the case as appropriate spectacles along with good lighting can significantly improve the quality of life for an older person. Poor eyesight is dangerous and all drivers should meet the legal requirement for driving. So what can you do to look after your eyes? Give up smoking! Smokers are much more likely to develop serious eye conditions such as age related macular degeneration (AMD). Eat healthy. Eating foods that are high in antioxidants (fruit and vegetables) has been linked to lower rates of AMD and other eye conditions. Get moving. Exercise, such as walking can reduce the risk of sight loss associated with diabetes and high blood pressure. Know your family history. Some eye diseases such as glaucoma may be hereditary. Protect your eyes in the sun. Ultraviolet light may contribute to the development of cataract and AMD so wear good quality sunglasses that carry the CE marking. Adults over the age of 16 should have an eye examination every two years although yearly examinations are recommended for certain groups of patients such as adults over the age of 40 with a family history of glaucoma and diabetic patients. Certain groups of people qualify for a free eye examination (sight test) under the NHS and some are entitled to a voucher to help towards the cost of spectacles if required. Children under the age of 16 are entitled to an NHS eye examination once every year or earlier if the Optometrist thinks that this is necessary. Children do not have to be able to read letters in order to have an eye examination as Optometrists often use pictures instead of letters to assess a child’s vision. A typical eye examination for adult patients lasts around 40 minutes. However, we aim to complete children’s appointments in around 20 minutes. Please bring your glasses and any old spare pairs with you. If you have a copy, your current prescription would also be helpful. For contact lens wearers, it’s really helpful if you can come in wearing your lenses and bring a sample of the packaging so we know exactly what you are using. We prioritise patient comfort and care and examinations are conducted in complete privacy although you are welcome to have a relative, friend or a member of staff accompany you. The majority of the examination is conducted in the same room. However visual fields tests, which are often used to support the core eye examination, are undertaken in a separate consulting room lasting around 10 minutes. Please bring a note of any medication or eye drops that you are taking. Access to the building is by three outer steps and assistance is available for wheelchair users. All of our testing and dispensing accommodation is on the ground floor.